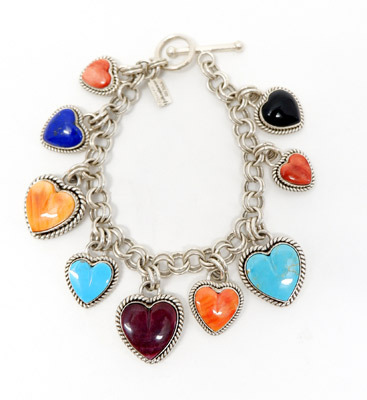 Tuquoise, lapis, black onyx and spiny oyster shells are set into sterling silver heart shape charms on this link bracelet by Artie Yellowhorse Designs. The heart shaped charms are surrounded by twisted rope detail and the large ones have a stamped design on the back. 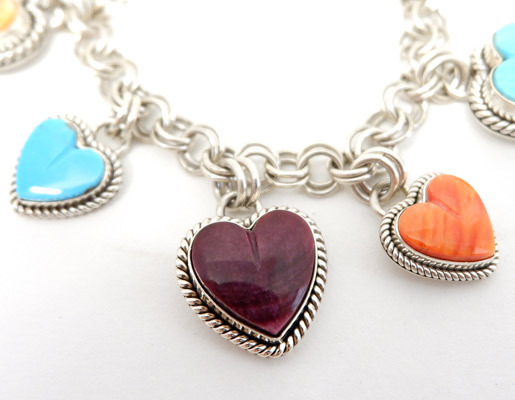 Navajo silversmith Artie Yellowhorse is known for designing jewelry with a keen fashion sense, clean lines and interesting stones. 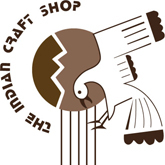 She has established a successful business in which her family and other Native American artists produce their designs, many of which have become classics in today's American Indian jewelry. For more information on Artie Yellowhorse Designs, click here.